Rupert Everett sits down exclusively with Wild About Movies publisher Tim Nasson and editor Dylan Tracy to talk about his movie The Happy Prince, in theaters October 10, 2018. 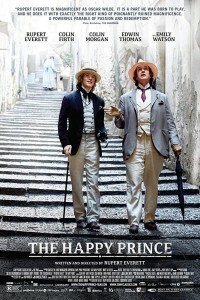 Everett wrote, directed and stars in The Happy Prince, a movie about the final years of author and playwright Oscar Wilde’s life. Everett has been acting in movies since his breakout performance in 1984’s Another Country. He may best be known for his big screen comedies The Next Best Thing (2000), opposite his friend Madonna, and My Best Friend’s Wedding (1997), opposite Julia Roberts. To the millennial crowd, his voice may be more familiar than his face, for his voice work in the Shrek movies as (Prince Charming) and as Mister Fox in The Chronicles of Narnia: The Lion, the Witch and the Wardrobe. Check out our on-camera interview with Everett, who talks about everything from moving back in with his mom, his role as Oscar Wilde, (where he gained a substantial amount of weight that he has subsequently lost), and being the first major movie star to come out of the closet, back in 1989. Beverly Hills, CA - "And the Oscar goes to. .